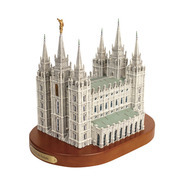 This inspirational piece depicts Joseph and his beloved brother, Hyrum standing united forever. Based upon the life-sized sculpture which stands outside the Carthage Jail, this statue has become a symbol of the love the two brothers shared. This bronze toned piece will make a meaningful addition to any home or office. This is a replica of the one outside the Carthage jail. Everytime I see this statue I get chills and it makes me so grateful for Joseph Smith and all he went through! How great to be able to give this to someone that admires the Smiths. What a tribute to these two amazing men! I love the prophet Joseph and his brother Hyrum. The figurine is a beautiful peace that adorns our home but more importantly serves as a reminder of those men who gave their lives for the cause. I love this piece! I love this statue and the love and support that these brothers had for each other and for the Lord. I pause each time I look at this work of art. My husband loves having this on his desk as a reminder when completing church work. Excellent detail! This is a wonderful statue reminding me when I was in Carthage, Illinois. A wonderful addition for anyones home. I Love the statue of Joseph and Hyrum that stands in Carthage Illinois, and I was very excited to find this exact replica. It looks beautiful on our mantle, and helps remind our family of the great examples these two men are.